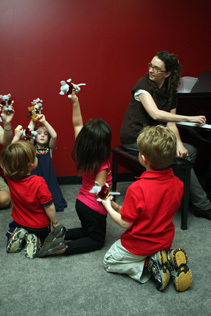 There are many “packaged” music programs available for Early Childhood Music classes, but Greater Richmond School of Music has made the decision to offer specialized classes designed by our very own Ms. Sally Ellithorpe (aka “Miss Sally”) and Ms. Jean McEntire, each of whom has over 40 years of experience teaching children music including in Early Childhood Music Education. Ms. Ellithorpe is a graduate of VCU with a degree in Music Education and holds Graduate Degrees in Early Childhood Education and Curriculum and Instruction. Ms. McEntire is a graduate of the University of Richmond with a degree in Music Education and holds a Master of Music degree from Virginia Commonwealth University. Your child will discover music in various styles through singing, movement, and playing instruments while interacting with peers in an age specific, education-focused, and fun environment. Through the foundations of music, your child will explore and develop core preschool developmental concepts such as numbers, letters, sharing, and cooperation. See Schedule & Tuition links for class availability. are specifically geared towards this young age. use instruments played by scraping, tapping and shaking. teach concepts at the basic level. show musical opposites (Loud, Soft, Fast, Slow, Short, Long). demonstrate how to keep a Steady Beat. contain movement activities assisted by caregiver. have themes and concepts over each course. contain the overall themes and concepts of: Names, Colors, Animals, Letters, Numbers, Body Parts, Seasons, Holidays, Personal Space, Taking turns, and Sharing. are fast paced to keep up with your busy little one. have lots of interaction with peers and teacher. explore musical concepts such as loud/soft, fast/slow, short/long and keeping a steady beat. 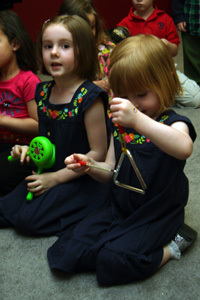 use instruments such as shakers, scrapers, and other various percussion instruments. work on students’ fine and gross motor skills.